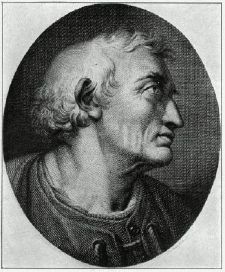 Amerigo Vespucci (March 9, 1454 - February 22, 1512) was an Italian merchant, explorer, and cartographer. He played a senior role in two voyages which explored the east coast of South America between 1499 and 1502. On the second of these voyages he discovered that South America extended much further south than previously known by Europeans. This convinced him that this land was part of a new continent, a bold contention at a time when other European explorers crossing the Atlantic thought they were reaching Asia (the "Indies"). Vespucci's voyages became widely known in Europe after two accounts attributed to him were published between 1502 and 1504. In 1507, German cartographer Martin Waldseemüller produced a world map on which he named the new continent "America" after Vespucci's first name, Amerigo. In an accompanying book, Waldseemüller published one of the Vespucci accounts, which led to criticism that Vespucci was trying to usurp Christopher Columbus's glory. However, the rediscovery in the eighteenth century of other letters by Vespucci has led to the view that the early published accounts were fabrications, not by Vespucci, but by others. Amerigo Vespucci was born on March 9, 1454, in Florence, Italy as the third child of a respected family. His father was a notary for the money changers' guild of Florence. Vespucci worked for Lorenzo di Pierfrancesco de' Medici, an Italian banker and politician, and his brother Giovanni, both of whom were part of the powerful Medici family that governed the city-state. In 1492, they sent Vespucci to work at their agency in Seville, Spain. Already in his 40s, around 1495, Vespucci became the director of a company that supplied ships for long voyages. His own first voyage reportedly took place in 1497, probably a trip organized by King Ferdinand of Spain, who wanted to clarify if the island of Hispaniola, which had been discovered by Christopher Columbus, lay near the mainland of "the Indies." Vespucci himself said that he went on the voyage to discover "new worlds." Juan Dias de Solis, a Portuguese explorer in service to Spain may have been the captain of this company, which set sail in May 1497. Accompanying Vespucci was pilot and cartographer Juan de la Cosa, the then-famous captain who had sailed with Columbus in 1492. According to the first letter of Vespucci, they reached land at 16 degrees latitude, probably on the coast of the La Guajira peninsula in present Colombia, or the coast of Nicaragua. They then followed the coastal landmass of Central America northward before returning to the Atlantic Ocean via the Straits of Florida, between Florida and Cuba. Although there is little tangible evidence of this trip such as maps or journals, Vespucci described the voyage in his letters. Once Juan de la Cosa returned to Spain, probably in 1498, a famous world map was produced depicting Cuba as an island for the first time. About 1499–1500, Vespucci joined a second expedition in the service of Spain, with Alonso de Ojeda as the fleet commander. The intention was to sail around the southern end of the African mainland into the Indian Ocean. After hitting land at the coast of what is now Guyana, the two seem to have separated. Vespucci sailed southward, discovering the mouth of the Amazon River and reaching 6 degrees south, before turning around and seeing Trinidad and the Orinoco River and returning to Spain by way of Hispaniola. The third voyage of Vespucci was led by Spanish explorer Gonoçalo Coelho in 1501–1502 in the service of Portugal, with Vespucci second in command. Departing from Lisbon, the fleet sailed first to Cape Verde, where it met two of Pedro Álvares Cabral's ships returning from India. In a letter from Cape Verde, Vespucci said that he hoped to visit the same lands that Cabral had explored, suggesting that the intention was to sail west to Asia, as on the 1499-1500 voyage. On reaching the coast of Brazil, they sailed south along the coast of South America to Rio de Janeiro's bay. Some have challenged the account that Vespucci reached the latitude of Patagonia before turning back. This portion of the journey seems doubtful since his account does not mention the broad estuary of the Río de la Plata, which he must have seen if he had gotten that far south. Portuguese maps of South America, created after the voyage of Coelho and Vespucci, do not show any land south of present-day Cananéia at 25 degrees south, so this may represent the southernmost extent of their voyages. During the first half of the expedition, Vespucci mapped the two stars of Alpha Centauri and Beta Centauri, as well as the stars of the constellation Crux. Although these stars were known to the ancient Greeks, gradual precession had lowered them below the European skyline so that they were forgotten. On return to Lisbon, Vespucci wrote in a letter to Lorenzo di Pierfrancesco de' Medici that the land masses they explored were much larger than anticipated and different from the Asia described by earlier Europeans. Therefore they must be a "New World," that is, a previously unknown fourth continent, after Europe, Asia, and Africa. In 1503, a final voyage was captained by Vespuccci, himself. The journey explored the southeastern side of South America, visiting coastline places such as Cape Soo Roque, Guanabara Bay, Rio de la Plata, Cape Santo Agostinho, San Julian, and spotting the Falkland Islands. His crew returned back to Spain in 1504 and told their story to mapmakers. Martin Waldseemuller, a German carographer, was one of the first to believe that Amerigo Vespucci was the first European to reach the mainland of the "New World." In 1507, he suggested they call it "America" after the voyager, and soon this name was used officially in the naming of the continent. In 1508, the position of pilot major (chief of navigation) of Spain was created for Vespucci, with the responsibility of training pilots for ocean voyages. He died of malaria on February 22, 1512, in Seville. Two letters attributed to Vespucci were published during his lifetime. Mundus Novus ("New World") was a Latin translation of a lost Italian letter sent from Lisbon to Lorenzo di Pierfrancesco de' Medici. It describes a voyage to South America in 1501-1502. Mundus Novus was published in late 1502 (or early 1503), and soon reprinted and distributed in numerous European countries. Statue at the Uffizi, Florence. Lettera di Amerigo Vespucci delle isole nuovamente trovate in quattro suoi viaggi ("Letter of Amerigo Vespucci concerning the isles newly discovered on his four voyages"), known as Lettera al Soderini, was writen in Italian addressed to Piero Soderini. Printed in 1504 or 1505, it claimed to be an account of four voyages to the Americas made by Vespucci between 1497 and 1504. A Latin translation was published by the German Martin Waldseemüller in 1507 in Cosmographiae Introductio, a book on cosmography and geography, as Quattuor Americi Vespuccij navigationes ("Four Voyages of Amerigo Vespucci"). In the eighteenth century, three unpublished "familiar" letters from Vespucci to Lorenzo de' Medici were rediscovered. One describes a voyage made in 1499-1500 which corresponds with the second of the "four voyages." Another was written from Cape Verde in 1501 in the early part of the third of the "four voyages," before crossing the Atlantic. The third letter was sent from Lisbon after the completion of that voyage. Some have suggested that Vespucci, in the two letters published in his lifetime, was exaggerating his role and constructed deliberate fabrications. However, many scholars now believe that these two letters were not written by him, but were fabrications by others based in part on genuine letters by Vespucci. It was the publication and widespread circulation of these letters that led Martin Waldseemüller to name the new continent America on his world map of 1507 in Lorraine. Vespucci used a Latinised form of his name, Americus Vespucius, in his Latin writings, which Waldseemüller used as a base for the new name, taking the feminine form America. Amerigo, itself, is an Italian form of the medieval Latin Emericus, which through the German form Heinrich (in English, Henry), derived from the Germanic name Haimirich. The two disputed letters claim that Vespucci made four voyages to America, while at most two voyages can be verified from other sources. Currently, there is a dispute between historians as to when Vespucci visited mainland the first time. Some, such as German Arciniegas and Gabriel Camargo Perez, think that his first voyage was made in June 1497, with the Spaniard Juan de la Cosa. Little is known of his last voyage in 1503–1504 or even whether it actually took place. 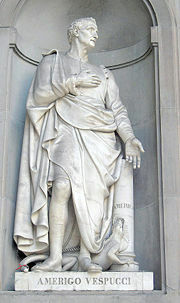 Vespucci left a controversy when he died, saying that he did not make the voyage that started in 1497. Today scholars still question whether Vespucci made the voyage. Vespucci also claimed that he captained all the journeys himself, but other sources indicate that he only captained one of the four reported expeditions. In any case, the results of Vespucci's findings were that North and South America were named after him, and that public knowledge spread that the "New World" existed and that Asia was no longer just beyond the horizon. In reality, two of the biggest continents were now understood to stand in the way of the westward voyage to Asia, and their riches and wonders were just beginning to be discovered. When thinking of Amerigo Vespucci, most think of his first name, which first appeared on Martin Waldseemüller's world map in 1507, as the name of the new continent, "America." In an accompanying book, Waldseemüller published one of the Vespucci accounts, which led to criticism that Vespucci was trying to steal the glory of Christopher Columbus's earlier voyages to the New World. However, Vespucci's real historical importance may well be due to his letters more than in his discoveries. From these letters, the European public learned of the newly discovered continent of the Americas for the first time. America's existence became generally known throughout Europe within a few years of the letters' publication. From then on, the average European had to ponder the possibilities of what a whole new continent meant in their lives and futures. Account of 'The First Voyage', 1497: Letter of Amerigo Vespucci To Pier Soderini. www.forham.edu. Amerigo Vespucci by Frederick Albion Ober www.gutenberg.org. This page was last modified on 18 March 2019, at 15:28.